Verizon’s MiFi was one of our favorite products of 2009: It takes a 3G wireless data signal and turns it into a Wi-Fi hot spot. 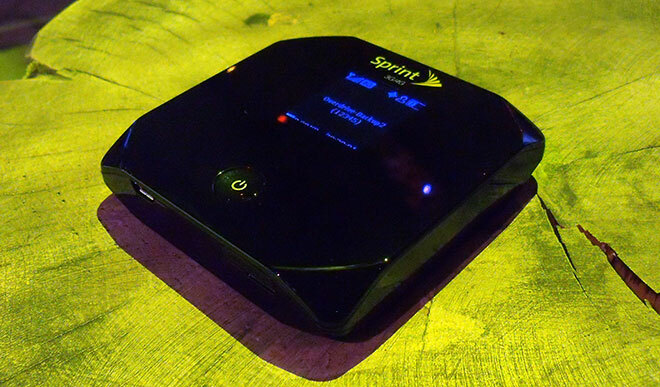 Now Sprint has one-upped Verizon with the Overdrive, which takes a 4G signal and turns it into a Wi-Fi hot spot. On Sprint’s WiMax-based 4G network, the Overdrive, which is about the size of a drink coaster, will reliably deliver 3 to 4 Mbps of download bandwidth, Sprint executives say, with peak speeds as fast as 10 Mbps. Upload speeds will be slower, but could peak as fast as 4.5 Mbps. Because the 4G network isn’t available everywhere yet, the Overdrive also works with Sprint’s widely deployed 3G network, which delivers 600 Kbps down and 100 Kbps up, Sprint says. The router then takes that internet connection and blasts it out as an 802.11b/g signal, with an “extended range” of up to 150 feet. It will support up to five simultaneous device connections. In demos, the Overdrive router was used to deliver streaming Netflix movies, Skype conversations, and webcam views simultaneously. Overdrive also contains a GPS receiver (accessible to network applications via a programming interface Sprint provides) and a MicroSD card slot, which can be used to store up to 16 GB of data for local access. Overdrive will sell for $100 with a 2-year contract at $60 per month for unlimited 4G data downloads, and up to 5 GB of monthly data on the 3G network. Sprint Leapfrogs Verizon With Fast 4G Hot-Spot Device | Gadget Lab | Wired.com.